NHS 111 is a service that makes it easier for you to access local NHS healthcare services. 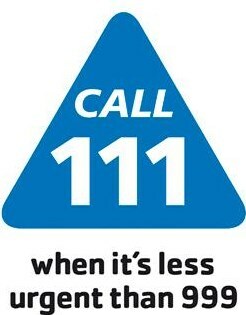 You can call111 when you need medical help fast but it’s not a 999 emergency. NHS 111 is a fast and easy way to get the right help, whatever the time. NHS 111 is available 24 hours a day, 365 days a year. Calls are free from landlines and mobile phone. You should use the NHS 111 service if you urgently need medical help or advice, but not if it’s a life-threatening situation.